Adventures I’ve had, and wanted to share. 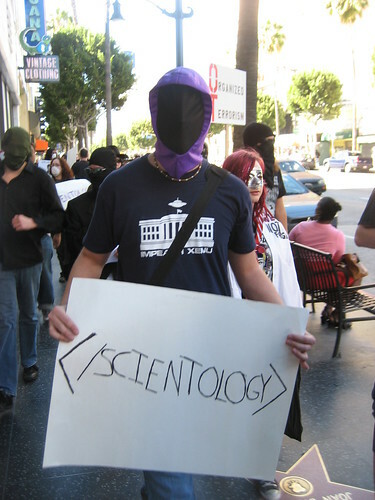 I just got back from the Anonymous protest of Scientology in Hollywood, and it could be summed up in two words: EPIC WIN. People showed up in droves — all wearing masks, and all referring to themselves as “Anon.” We picketed in groups of up to 200 people, and I saw more than 500 different protesters over the course of the day. The turnout was truly amazing, and there was so much energy and excitement. If anything, we certainly sent a message to the public, and to the Scientologists themselves that their corporation is corrupt and unethical.